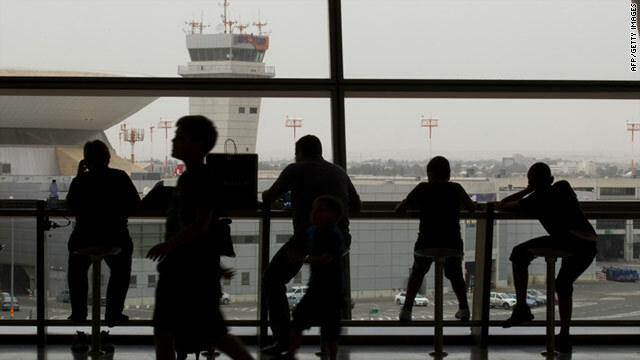 Passengers wait at Israel's Ben Gurion International Airport. The airport is on high alert ahead of the arrival of pro-Palestinian demonstrators. Jerusalem (CNN) -- Israeli authorities are on high alert ahead of the expected arrival of hundreds of pro-Palestinian demonstrators at Israel's Ben-Gurion International Airport this Friday. Israeli police are preparing to handle flights scheduled to come in from Europe carrying activists, it says who may attempt to cause disruption upon their arrival in a type of "aerial flotilla." Speaking to CNN, police spokesman Micky Rosenfeld said, "We are fully prepared to respond immediately and prevent any provocative incident from taking place at the airport" in Tel Aviv. Major Gen. Bentzi Sau, appointed manager of the Israeli operations, has said in a radio interview that "Israel will allow any foreign citizen to arrive and travel the country but will not permit entrance of people suspected of disrupting order." Hundreds of police officers are expected to take part in the operation. I don't know who invented this story. We are only coming to visit the West Bank and show solidarity with the Palestinian people. While Israel is making serious preparations for the event, the activists say they do not have a distinct action plan. Olivia Zemor, organizer of the French delegation of mission "Bienvenue en Palestine" (Welcome to Palestine), representing 350 activists out of 600 who are expected to land at the Israeli airport maintains her group has no intention of causing disturbance. Speaking to CNN, Zemor said, "I don't know who invented this story. We are only coming to visit the West Bank and show solidarity with the Palestinian people." Yet, Zemor said she and her fellows will protest if we are treated badly or humiliated. "They don't have the right to refuse us the right to visit. Each one of us is going to say that we are part of the mission and do not to stay at the airport. We are going to go there and queue normally as the other passengers. Of course, if they are going to select people without any reason, without any explanation to deny our entry, we will object," she said. Israeli Prime Minister Benjamin Netanyahu held a special meeting Wednesday morning at the Ben-Gurion Airport with security officials in order to supervise the preparations. Netanyahu said, "Every country has the right to deny entrance of provocateurs and trouble-makers into its borders. This is how all countries behave and this is how Israel will act. We must act with determination but with minimal friction, maintain order and prevent disruption of normal life for the citizens of Israel." The latest development comes in wake of recent failed attempts to jump start a second naval flotilla to the coasts of Gaza aimed to protest against Israel's naval blocked of the Hamas ruled Palestinian territory. Heavy diplomatic pressure applied by Israel and a series of technical problems have so far prevented the Gaza-bound ships from sailing off the coasts of Greece. In May of 2010, the Mavi Marmara -- owned by the Turkish Humanitarian Relief Foundation, or IHH -- and five other ships were on their way to Gaza laden with humanitarian aid and about 700 activists from various countries when the Israeli soldiers boarded it. In clashes with Israeli navy commandos, the nine people were killed.